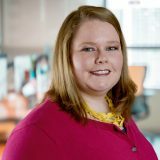 Lauren Howard serves as Vice President of Client Success for FreightRover. She previously served in various leadership roles including Divisional President and Vice President of Customer Service at Celadon Group. She has spoken nationally on topics of innovation in transportation, technology integration, and attracting and retaining a Millennial workforce. She also writes frequently on the topic of women in the workplace. Lauren helped earn Commercial Carrier Journal’s 2023 Innovator of the Year honors, is a two-time Indy’s Best & Brightest Finalist, and a YWCA Women of Achievement nominee. Her company FreightRover, which specializes in transportation and logistics technology, recently was named Indiana’s Best New Tech Startup. Prior to her work in technology and transportation, Lauren spent the first 12 years of her career serving Indiana non-profits focused on quality educational opportunities for Hoosier children including Indianapolis Public Schools, the Indiana Association for the Education of Young Children, and the Center of Excellence in Leadership of Learning at the University of Indianapolis. She holds a bachelor’s degree from Butler University, Master of Business Administration from the University of Indianapolis, and is Accredited in Public Relations. Lauren also participates in Conscious Capitalism of Indianapolis, the Indianapolis Customer Experience Network, and several groups supporting the recruitment and development of women in tech in Indiana.